Run for your lives! Oh wait, that won't work. In the 1951 sci-fi classic When Worlds Collide, a vicious one-two punch in the form of Bellus and Zyra, a rogue star and orbiting planet are hurtling through space directly for the planet earth. Our hero, research scientist Dr. Hendron (Larry Keating) confirms the inevitability of the collision with a year to spare, but is mocked by the newly formed United Nations General Assembly and tossed out on his ear. By the time the rest of the world finally comes to grips with the truth of the situation, it's too late to do anything about it — too late, that is, for everyone except Dr. Hendron and his circle, who have endeavored to build a futuristic Noah's Ark in the form of a gigantic sleek silver rocket. Their plan is to launch at just the last second, and hopefully land and begin civilization anew on Zyra, the small, earth-like (hopefully) planet. A scant forty-four people can be saved, and much of the film's drama concerns preparation for the cataclysm and the selection of the lucky few. Despite a short running time, there's plenty to hold our attention (it's actually too bad this couldn't have gone on for another twenty minutes or so — there are plenty of threads that could have been woven into a more detailed fabric.) There's a love triangle involving 50s honey Barbara Rush, the ship's M.D., and her reluctant pilot; as well as a great deal of moral and ethical tension generated by the wheelchair-bound gajillionaire who's paying for the whole thing — in exchange for one of the coveted seats. One of the cleverest plot twists has Zyra passing close enough to the Earth to disrupt the tides and flood all coastal cities nineteen days in advance of the fiery collision with Bellus. It adds a moment of real suspense and worthwhile special effects to the middle of the film, and as an added bonus it solves the problem of pissed-off, gun-toting mob of rejects making a run on the rocket during the eleventh hour — the launch site is on a mountain top, and Zyra has flooded all low-lying territories. The effects are pretty darn good, all the more so because this was shot in very vivid technicolor — good enough to nab the effects Academy Award (not to mention a color cinematography nomination). Most of the tricks are done with miniatures, but they are impressive to say the least and will have you wondering if it isn't the real thing in a few of the cuts. There's an interesting flood sequence that anticipates the likewise Oscar-winning effects in The Rains of Ranchipur. There might be a few seconds of stock footage here and there, but who cares? This is great stuff. Unfortunately this is 1950s America — no black folks allowed. Asians? Sorry. The script does vaguely reference similar rockets being built in other countries, but the notion contradicts the earlier idea that the initially sceptical would be unable to complete a ship in time. The new civilization on Zyra will be young, white, and good looking — and with cute puppies. The film makes a meager overture to civil unrest amongst the hundred of rocket-builders who don't get a space on the flight, but it takes a nod and a wink on the part of viewers to think the rocket would have ever gotten off the ground. Yet it does, and miraculously manages to set down on the surface of Zyra. The hatch opens to "the sweetest breath" one traveler ever took, and a cartoonish world of green fields, pink trees, snow, and a few rather Egyptian looking pyramids. It's a strange teaser for the film to end this way — if this was a contemporary picture we'd all shout, "Sequel!" The Zyran landscape obviously contains buildings, but we are left to wonder whether or not they contain living beings, friendly or otherwise. The idea of competing rocket projects, particularly those from other countries and other governments, makes the idea of a sequel very intriguing. Apparently George Pal wanted to do a follow-up along those lines, but it just never panned out. 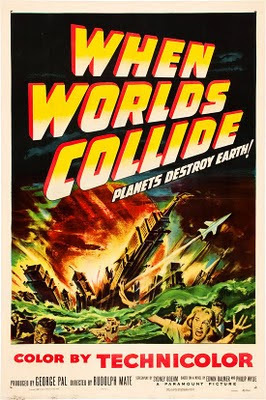 Nevertheless, this is a fun fifties sci-fi gem, with enough polish to please all viewers. Plus, it sports one honey of a poster. It's my understanding that those unbelievable shots on Zyra were early mockups of the special effects to be inserted, not much more than storyboards. They ran out of money and time so the studio went with those instead of investing more of either. That's the reason they're so cartoony.